Through NetGalley, McGraw-Hill Professional was kind enough to share a copy of this eGalley for the purposes of my reading and reviewing it. Although it was provided to me at no cost, I am under no obligation to give a positive review. While I typically review books that interest me in order to provide the publisher and author with an honest review from someone who is hopefully within their target market, I’ve yet to run across a review opportunity that was so perfectly timed. You see, this is a book that helps high school students write the best possible college application essays, and here I sit with my younger son a high school junior with incredible college potential (he wants to go to med school and is more than capable). So not only do I get to review the book, but I get a great opportunity to see if this is something I would like to get in print format for my son. That answer, by the way, is a resounding yes. I have always been a proponent of empowering our children, and I’ve been even more adamant about that following the death of my wife two years ago. Since I don’t know when my time will come, my boys have to be as prepared for life as possible. One of things I really like about this book is Barash expects parents to be almost completely hands-off in the process. Encourage. Offer suggestions when asked, and only when asked. But under no circumstances fix the writing, not even a comma. Once you start doing that, it’s a slippery slope toward the parent being the author instead of the child. And if our children are going to be independent in college, why not start now? The most important thing is the story must be in your child’s voice. It may have flaws, it may have grammatical or spelling errors, but most of all it must be honest. Since the admission staff at colleges read hundreds if not thousands of these every year, it’s easy for them to spot a stilted essay that is trying to tell them what the author thinks they want to hear. Scrap that. As a prospective college student, tell them the story you want to tell. Or better yet, the one you have to tell. The vast majority of the book consists of exercises to assist the student in writing the best possible essay. 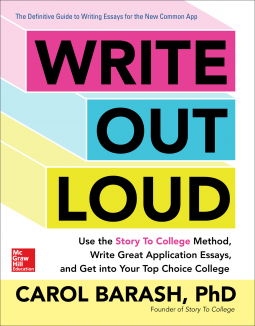 Make no mistake about it, the book is intended as a companion to the Story To College website, with which Barash is also affiliated, but it does stand on its own. While I didn’t do all the exercises, as I didn’t want to have any pre-conceived notions of what my son might or might not want to write, I did skim through them to see what they were trying to accomplish, and I am impressed. Bottom line is, if you have a student who has any interest in going to college, this book could be of great benefit to him or her. I will definitely be getting a print copy for my son.